SAN ANTONIO (AP) The Spurs are glad to have Tony Parker back, especially LaMarcus Aldridge. Aldridge set his San Antonio high with 41 points and the Spurs spoiled J.B. Bickerstaff’s debut as Memphis coach, beating the Grizzlies 104-95 on Wednesday night to hand them their ninth straight loss. Aldridge established a season best for the second consecutive game, topping his 33-point outing Monday against Dallas. It’s not a coincidence that the 6-foot-11 forward has enjoyed two big games in a row since Parker returned. Aldridge scored 17 of San Antonio’s first 19 points, going 6 for 7 from the field and 3 of 3 on 3-pointers. He finished 17 for 24 from the floor while falling three points shy of the career high he set with Portland. ”LaMarcus was just hot. He had a great game,” said Memphis’ Tyreke Evans, who scored a team-high 22 points. Parker had 10 points and five assists while playing 18 minutes in his second game back since undergoing surgery to repair a torn left quadriceps tendon. 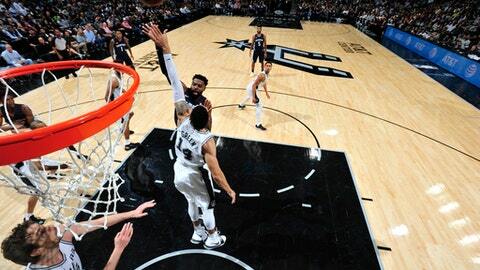 The Spurs took their largest lead at 66-51 three minutes into the third quarter after Parker set up Aldridge for 19- and 20-foot jumpers. San Antonio, which became the first NBA team with 10 home wins this season, has won three straight overall. The Grizzlies continued to play short-handed in their first game since coach David Fizdale was fired. Memphis was without Mike Conley, Chandler Parsons, Mario Chalmers and Brandan Wright. The Grizzlies have not won since beating Portland on Nov. 7, but they found some hope against the Spurs after a lackluster effort in a 98-88 loss Sunday against Brooklyn in their final game under Fizdale. Gasol finished with 10 points on 4-for-11 shooting. Grizzlies: Conley will miss another two to three weeks as he continues treatment on a sore left heel and Achilles tendon. The 11-year veteran has been out since Nov. 13. … Parsons missed his third game of the season as part of a planned absence for treatment on his right knee. … Chalmers sat out with an injured right ankle. Spurs: Parker went to the locker room with 6:04 left in the third and returned with 1:44 remaining in the quarter with his left knee wrapped in ice. He went inside with a trainer and was not followed by team doctors, who remained in their seat while Parker was in the back. … Aldridge’s career high of 44 points came against Denver on Jan. 23, 2014, with the Trail Blazers. … Aldridge has 32 3-pointers with the Spurs, two more than Tim Duncan had during his 19 seasons in San Antonio. Gasol dismissed speculation that he played a part in Fizdale’s firing because of a supposedly frosty relationship between the coach and veteran player. Gasol was upset he did not play the entire fourth quarter of Memphis’ loss to Brooklyn, but said he had nothing to do with Fizdale’s firing. Grizzlies: Host the Spurs on Friday night to complete a home-and-home set. Spurs: Visit the Grizzlies on Friday night trying to snap a two-game skid at FedExForum.